44 pages of traditional songs to help you polish your technique. 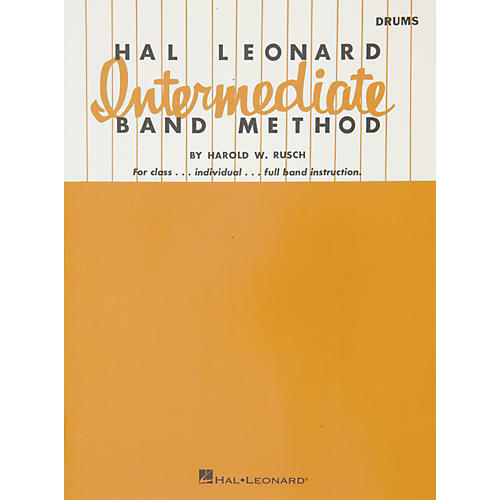 Hal Leonard's Intermediate Band Method by Harold W. Rausch is the perfect guide for that drummer looking to improve his or her technique and ability. It has 44 pages of instruction with a song list as long as your arm. "Avalanche, Op. 45, No. 2"
"The Blue Bells Of Scotland"
"A Grotesque Dance (17th C.)"
"Li'l Liza Jane (Go Li'l Liza)"
"My Country, 'Tis Of Thee (America)"
"O God Beneath Thy Guiding Hand"
"Our Boys Will Shine Tonight"
"Robin And His Merry Men"
Get you kicks with your sticks working out with these songs. Order this method book today!